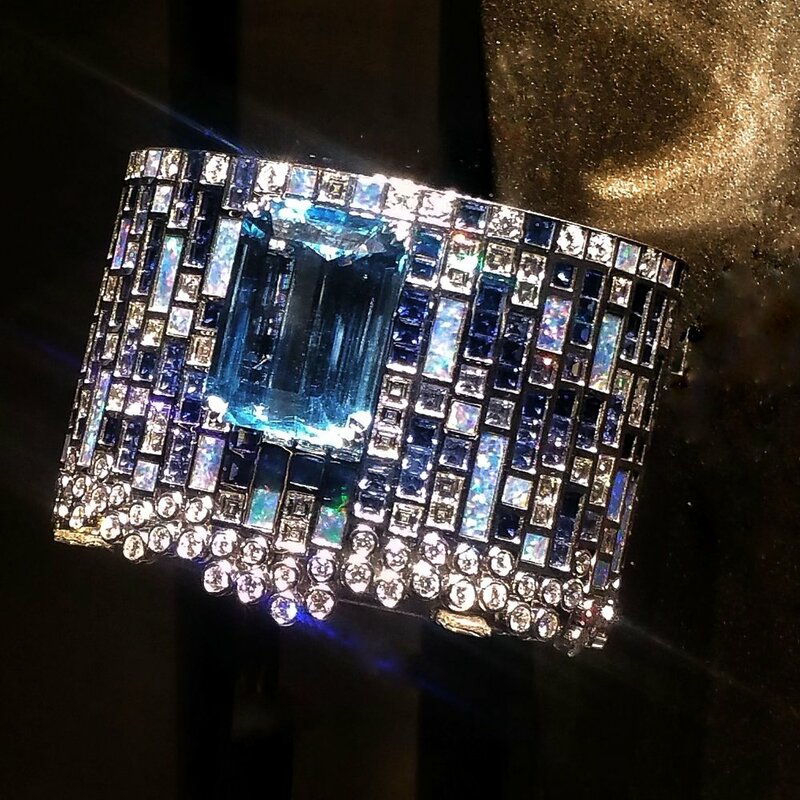 The vibrant colors of the sun-soaked Mediterranean coast and the region’s glamorous lifestyle were at the heart of several Haute Joaillerie collections presented during Paris Couture Week in July. While the Chanel jewelry collection recalled the elegant four-masted schooner owned by one of Coco Chanel’s great loves (see earlier story here), Piaget found inspiration in the scenic beauty of the Amalfi Coast. Full of blue sapphires and yellow diamonds, Sunlight Journey is Piaget’s fourth sun-inspired collection, following the popular Mediterranean Garden, Secrets and Lights and Sunny Side of Life collections, it continues to evoke the joie de vivre of the riviera, while displaying the maison’s craftsmanship matched by a number of dazzling collaborations with masters of their crafts, such as feather artist Nelly Saunier, lacquer artist Isabelle Emmerique, renowned enameller Anita Porchet and marquetry artist Rose Saneuil. Rich in golden colors and fiery orange, the collection evokes a coast bathed in sun from dawn to dusk. 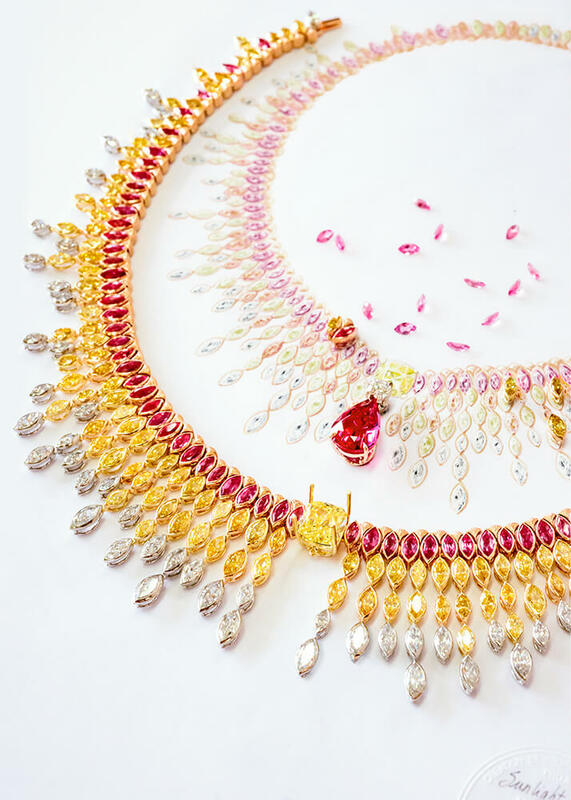 The first burst of sunlight gently kissing the water lapping on a beach is brought to mind with an abstract wave decoration in pink gold, iridescent white opals, Paraiba tourmalines and blue chalcedony beads mixed with diamonds; meanwhile a series of artistic watches with an enamelled or a gold leaf dial with eggshell mosaic decoration continues the sense of a morning’s gentle sun. Piaget also showed a more daring side with its golden shore watch, a pink gold cuff watch with Palace decoration that offer an asymmetric, rocky edge view of its white opal dial. These more flamboyant designs recalled a sky-high midday, inviting to plunge into a sea of blue sapphires, black opal, and emerald greens. The green shades of the Mediterranean was beautiful represented in the “Verde Bisazza” watch, an asymmetrical mosaic of baguette-cut emeralds, diamonds and black opals and the Aquatic Maze watch with a green wood and straw marquetry dial. The Sunlight Journey collection offered exceptional stones like a 45.99-carat blue star sapphire at the focal point of a sautoir necklace sparkling with blue marquise-cut gems, diamonds and feathers; a 20.14-carat emerald-cut blue sapphire necklace with baguette-cut sapphires, black opals and diamonds creating an asymmetrical effect of waves lapping against the shore; a 8.9 carat black opal hiding a mother-of-pearl dial on a cuff-watch in white gold. A late sunset clothing the sky in orange, pink and gold came to life with colourful beams of pink sapphires and red spinels, explosion of rubies and diamonds featuring sunbeam motifs often embraced by the French Maison: A 6.63-carat cushion-shaped yellow diamond glowed in the company of red spinels, yellow and white diamonds while a stunning secret ring, hidden some delicate feather marquetry under a bed of red spinels, purple sapphires, and diamonds. 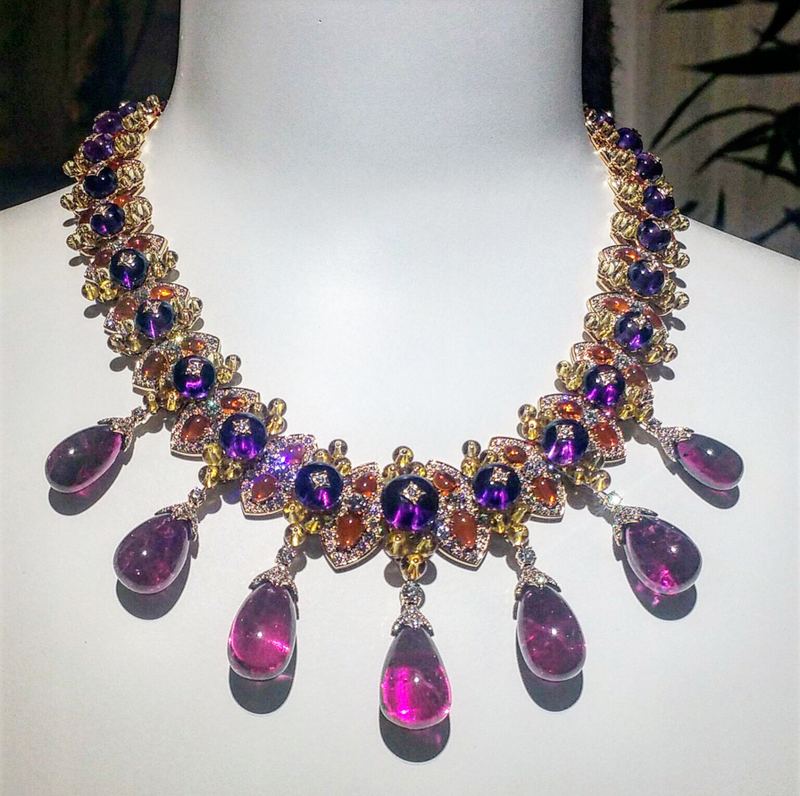 Simply title Mediterranea, the 19 high jewelry piece collection of Giampiero Bodino found inspiration in the scents and colours of the Mediterranean Sea, using a palette of pink opals, amethysts, blue sapphires, yellow beryls and fire opals. The Bougainvillea necklace and earrings in diamonds, pink sapphires and red spinels celebrated the emblematic flower of the Mediterranean spring, the Tesori del mare bracelets and ring conjured a blue sea with elegant layers of white diamonds and blue sapphires in. 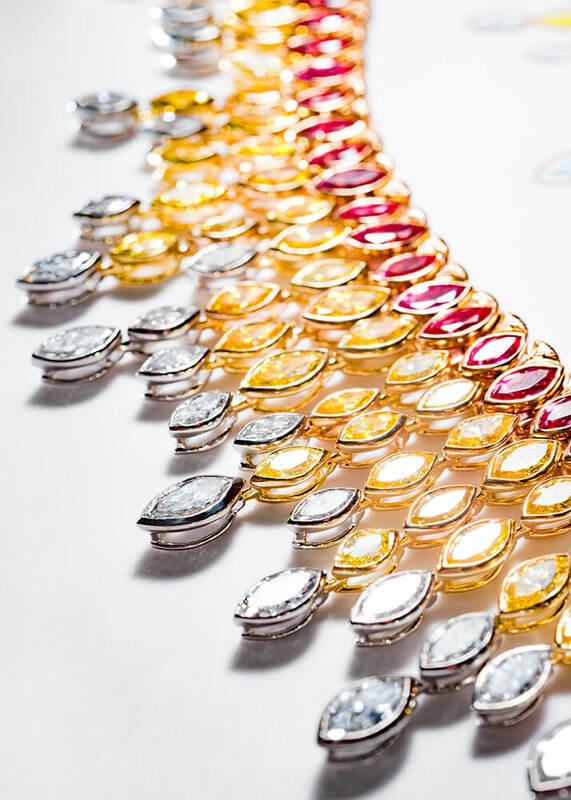 The Milan-based jeweler, known for being bold in his use of colors, has extended the palette and reinterpreted signature motifs in one-of-a-kind pieces for the Mediterranea collection. 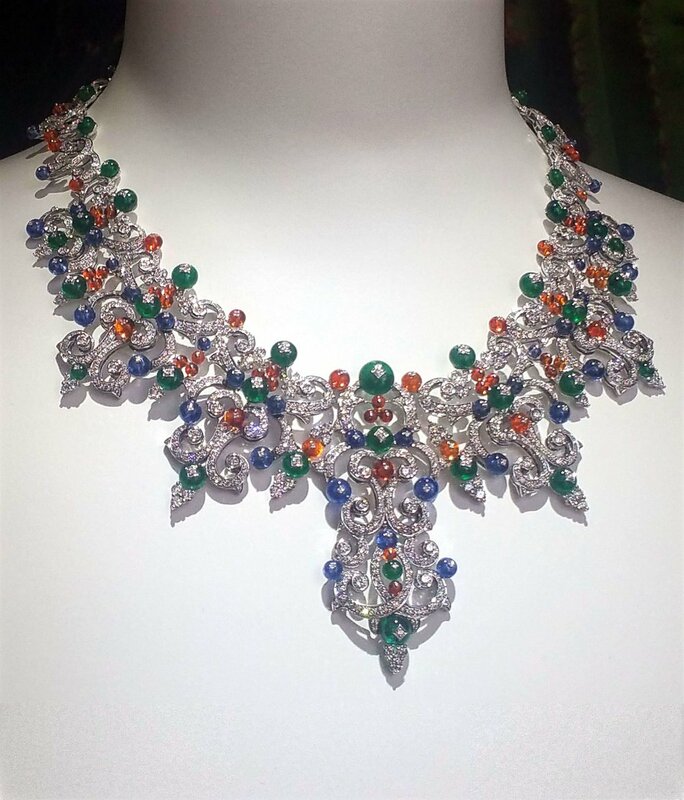 “We have a brand new association of color: green, blue and orange, and it was inspired by the three colors used on the Sicilian majolica vases [tin-glazed pottery] and we found stones that match,” the jeweler told Couturenotebook, pointing to the Corona necklace, bracelet and earring set with its ornate pattern of gemstones mixing and contrasting sapphires, emeralds, and fire opals beads linked by strands of white diamonds on white gold. Amongst the highlights was a necklace and its matching bracelet both set with blue sapphire beads studded with a Fleur de Lys motif and diamond stars. The paved-diamond bracelet was scattered with seashells in lightweight titanium set with contrasting multi-coloured precious stones, inspired by the carefree pleasures of summers by the sea. Another stunning piece is the sautoir necklace glowing with pink opals and amethyst cabochons, with a matching bracelet that flows sensuously around the wrist. For the time, the jeweller used titanium on some of his pieces, to makes his stone-rich creations lighter to wear. 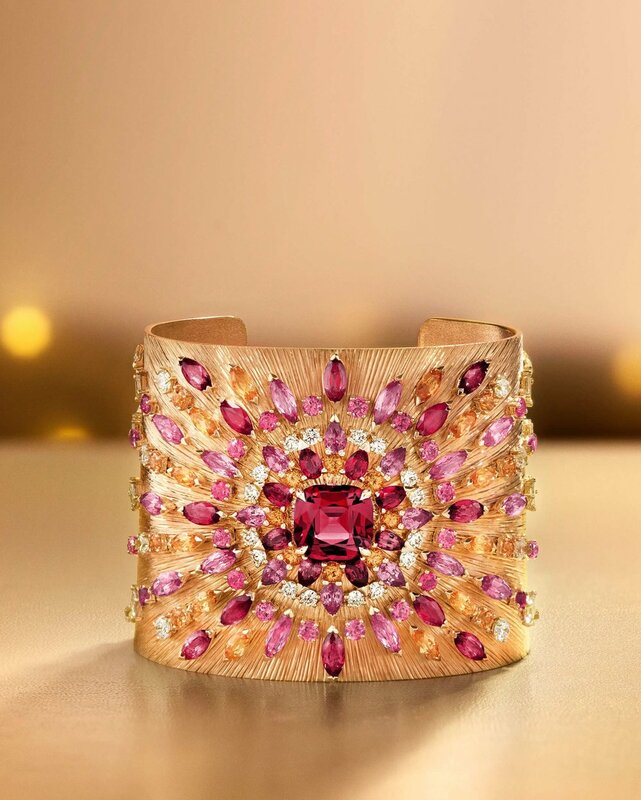 Rounding an Italian theme amongst these haute joaillerie offerings this summer, Parisian jeweller Mellerio dits Mellers looked at the Borromean Islands, a group of three small islands on Lago Maggiore in Northern Italy, and in particular Isola Madre known for its picturesque buildings and stunning garden to create a small collection that mixed pink sapphires, spessartite garnets, tsavorites and green tourmaline. A beautiful tourmaline from Namibia with turquoise undertones proved the starting point of this collection and serves at the centerpiece of a ring, with pink sapphire, garnet and spessartite set in grainery of tiny gold balls that stand out on a green enamel base that has been worked in guilloche that aim to evoke waves. A second island, Isola Bella, will be tackled next year.